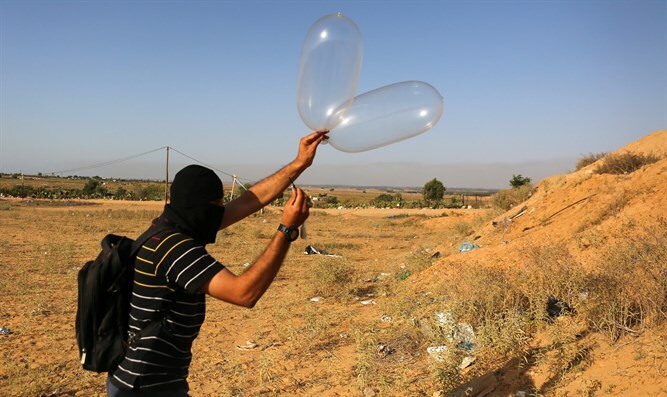 IDF aircraft strike terrorists launching incendiary balloons from Gaza into Israel. On Sunday night, an IDF aircraft carried out an attack on a cell of terrorists that fired incendiary balloons from northern Gaza into Israeli territory. The attack followed the discovery of an incendiary balloon in an open area of the Eshkol Council Region. Earlier on Sunday evening, another incendiary balloon was found in the Sdot Negev Region community of Yoshivia, near Netivot. A sapper neutralized the explosive balloon, and no damage was caused. Over the past several months, over 25,000 dunams (6,177.6 acres) of Israeli nature reserves, forests, and agricultural land have been scorched by incendiary kites and balloons sent from Gaza into Israel. Last week, the Hamas terror group promised to end the use of incendiary kites and balloons by the end of this week. However, they later backtracked, claiming that Israel’s closure of the Kerem Shalom crossing – which came in response to the arson and rocket terror – prevented them from putting an end to the arson terror.